After the zombie apocalypse started some people hated the monsters, and some sympathized with them. Those who sympathized lived in fear, afraid they too would be killed for no reason. Amanda Bretz was one of those people. Amanda Bretz lost a lot and didn't think she could lost anymore, until she did. 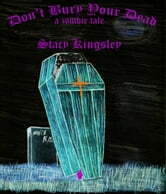 Now she is looking for revenge, and nothing will stand in her way, even the coffin she has been buried in. Forgive Me, Father, For I Have...Burp!